Posted on April 3, 2019 by admin in Cats. Tabby is a 9 year old female. She is quite a nervous cat who needs an owner that can give her a quiet and secure home. 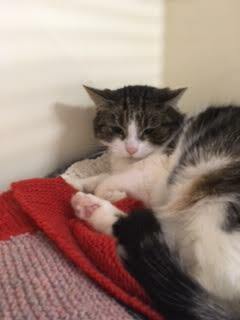 Tabby is a lovely cat who has ended up in the Heatons through no fault of her own. She would need an experienced cat owner who would understand that she needs her own space but equally offer her a nice safe lap to curl up on at the end of the day. Tabby would make an amazing companion to someone who can give her the time to grow and come out of her little shell. We will not rehome Tabby to a household with children. Tabby is all ready for her new home.